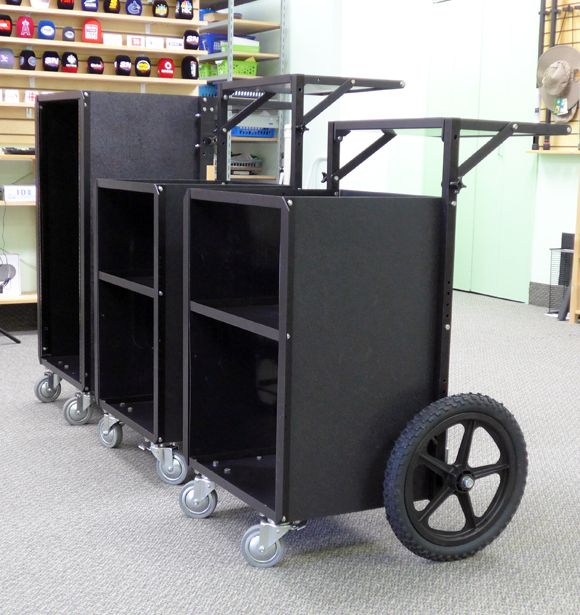 The ASC Dakota Cart has been the cart of choice for Toronto's sound recording and video playback technicians for over 20 years. Rackmount ready and built to last from quality components, the Dakota cart is practical, adaptable and designed to last. We've shipped them across Canada and around the world. Our loyal customers have long appreciated the craftsmanship and quality of our custom cables and cable snakes. Our cables are designed to work the way you work - don't settle for "off the shelf". We use Canare, Mogami, Gotham, Belden, Neutrik, Cannon, Switchcraft, Hirose, Suhner and other top quality components, as well as cable and connectors you simply will not find anywhere else. Passive and Active splitters, custom adaptors and breakouts, ASC Phantom Power supplies and more! Automatic battery switchers, custom power breakouts for the bag and the cart, V-lock adaptor plates and more! RF Mounting plates for cameras, batteries, and mixer bags, custom output and input cables and more!